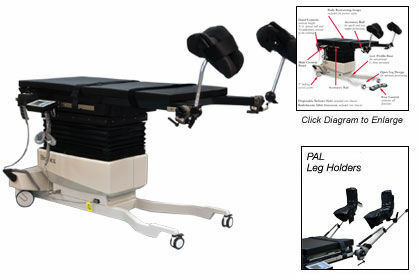 Designed to Function with a 3D C-Arm - The 3D Imaging C-Arm Table is designed and equipped for use with 3D C-Arms for seed implantation, urology, thoracic vascular and other general C-Arm applications. The table features motorized actuation of height, X-Y, lateral roll and Trendelenburg motions of the tabletop. The narrow, low-attenuation carbon fiber tabletop is cantilevered to accommodate portable 3D C-Arms. The functional design provides complete access with minimal radiation exposure to clinicians. Click here to see more information or purchase this item directly from the manufacturer.